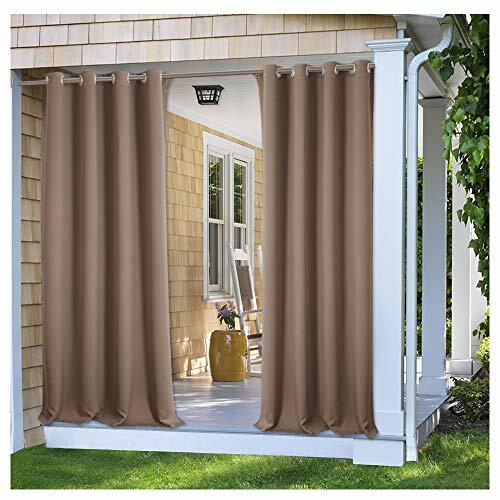 PONY DANCE Outdoor Blackout Curtain helps you enjoy the carefree and relax outdoor moment as much as you could. It can protect you from harsh sunlight, UV Ray,strong wind and mildew. 1.Weather-resistant grommets top is rustproof & won't ruin the curtain fabric. 2. Made of triple woven micro-fabric, PONY DANCE Outdoor Blackout Curtain is heavy-duty, color-resistant and waterproof. 1. PONY DANCE outdoor blackout curtain can protect you from 85%-99% harsh sunlight, UV ray and strong wind outside. In addition, it is anti-bacterial and mildew repellent. Good for your and your family health. 2. The outdoor blackout curtain can be used to create a private space for you outside if necessary, protecting your indoor /outdoor privacy. 1.The outdoor blackout curtain can match with your home decoration, perfect for patio, front porch, garden, and other outdoor spaces. 2. The blackout curtain can also serve as living room / bedroom blackout panel and offer you the benefit of thermal insulation, summer heat and winter chill prevention, sound reduction & sound sleep guarantee. 1. Each outdoor blackout panel measures 52"wide.Available in 84", 95" and 108"lengths. 2. 8 colors available:Grey,Beige,Black,Brown,White,Taupe,Teal Blue,Grass Green. Note: Due to differences in computer monitors display, there can be color variations between the actual product and your screen. READY MADE - A package includes 1 PONY DANCE outdoor curtain panel measuring 52" wide by 95" long. Check your frame dimensions for proper fit before choose the curtain size. SILVER GROMMET - 8 RUST PROOF rings top (1.6" inner diameter) fit to most standard curtain rods, easy to slide and fade resistant, enable the curtains to last long. DURABLE MATERIAL - Outdoor shade drapes made of fade & mildew resistant waterproof polyester, specifique for using in the outdoors indoors conditions. SERVE WELL - Impede 85-95% harsh sunlight and UV ray (Dark color work better), privacy protect, block against strong wind, enabling you to enjoy a pleasant outdoor time. HEAVY-DUTY - Quick iron or steam clean, machine washable. Risk-free purchase with 30 days return policy. Visit our PONY DANCE store to find out more indoor outdoor drapes.